The Humble Bundle guys are now charging a minimum $1 for Steam keys, thanks to jerks who are using one-penny bundles to cheat Valve's current promotion. 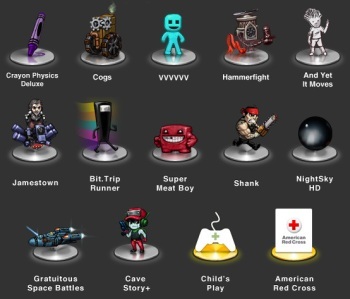 The Humble Indie Bundle 4 is crazy awesome. Pay what you want for a dozen games - good ones, too - plus soundtracks, all cross-platform, DRM-free and, for maximum convenience, available through Steam. But Bundle buyers who want Steam keys are going to have to pay a little more than the minimum, thanks to gamers taking advantage of the system to gain an unfair advantage in the current Steam draw. "Hey guys, we've noticed that a number of un-humble users are buying lots of Humble Indie Bundle 4s for one penny, and then using their Steam codes to 'legitimize' automated Steam accounts in order to increase their odds of winning prizes in Valve's current raffle promotion," the HIB team wrote on the Humble Bundle blog. "This is unfair to legitimate entrants and is definitely not what we wanted to encourage with Humble Indie Bundle 4. It's a lose-lose situation for the indie developers, charities, Valve, and Humble Bundle. Therefore, starting immediately, new orders under a humble threshold of $1 will not contain Steam keys." One dollar for a bundle like this is still ridiculously cheap, but gamers who really, honestly can't afford it [and who simply must have a Steam key] can contact the Humble Bundle support team, which will provide them on a case-by-case. That's amazingly generous, but I think I'd be more inclined to provide advice that if you can't afford a dollar, maybe you shouldn't be spending money on videogames in the first place.